Warn by Helen Mirren in the movie "The Queen", this Beaufort cotton waxed has a rustic and elegant style. Created by Margaret Barbour in 1983, this Beaufort jacket is one of the most famous of the Barbour jacket range. Elegant, fancy and timeless, this jacket can be warn all year-round. This Thornproof jacket has a corduroy velevet collar, a ring or the front zip closure, it has a removable hood and detachable lining. This jacket is shorter than the other traditionnal Barbour jackets and has a long open back pocket. Velcro bindings at cuffs with the double zip closure prevent from wind. Larges hand warming pockets on sides with a detachable padded lining will prevent from the cold. This jacket became very popular thanks to the movie "The Quenn". The actrice Helen Mirren carried this jacket in the rôle of S.A.R Queen Elizabeth II. Sizes are available in our stores, please contact our Customer Service at 02.98.85.47.37. 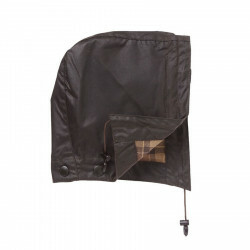 Barbour Rustic waxed cotton hood. A great winter essential, this Barbour fleece lining fits in Barbour jackets or may be worn as a waistcoat. Inside tartan lining 100% cotton. Sponge cleaning or cloth cleaning only.